Georgian scientists on Friday presented a 1.8 million-year-old skull discovered in the Caucasus nation that researchers say could force a re-evaluation of current theories of human evolution. The skull—unearthed in the medieval town of Dmanisi some 100 kilometres (62 miles) southwest of the capital Tbilisi—is the first completely preserved skull found from that period. Along with four other skull samples uncovered at the site, it appears to show that early man was a single species with a wide range of looks rather than several distinct species. 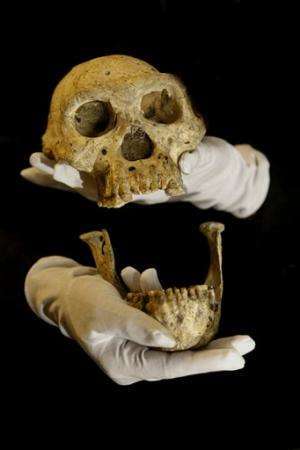 "Today in this skull—and the other Dmanisi samples—we see all the features lumped together in one group that we previously thought identified different groups," David Lordkipanidze, Georgia's national museum director, told AFP after a presentation in Tbilisi on Friday. "This is the most important thing—we are touching the earliest stages of genus homo and its lineage," Lordkipanidze said. The collection—which is housed in the vault of Georgia's national museum—is "the richest collection of hominids in the world from that time", according to Lordkipanidze, the lead researcher on the project. "We wanted to share with the Georgian public here what we had found," he said before allowing a small number of journalists into the vault to see the original skull. The stunningly well-preserved find—known as Skull 5—has an almost-complete set of teeth and seems more elongated than a normal human skull. The fossil—which is about a third the size of a modern human head—is normally kept in a special padded box in the vault. Wearing white gloves to avoid contaminating the sample, a beaming Lordkipanidze held up both the jaw and main section of the skull as photographers took pictures. A replica of the skull was unveiled for display to visitors in the museum. The conclusions—published in the US journal Science on Thursday—are the result of some eight years of research carried out by Georgian and international scientists since the discovery of the skull in 2005. The skull was found lying a few metres from where its jawbone had been discovered earlier in 2000. The scientists behind the discovery claim the different lineages some experts have described in Africa—such as Homo habilis and Homo rudolfensis—were all just ancient people of the species Homo erectus who looked different from each other. They also suggest that early members of the modern man's genus Homo, first found in Africa, soon expanded into Asia despite their small brain size. But not all experts agree. "I think that the conclusions that they draw are misguided," said Bernard Wood, director of the hominid paleobiology doctoral program at George Washington University. "What they have is a creature that we have not seen evidence of before," he said, noting its small head but human-sized body. "It could be something new and I don't understand why they are reluctant to think it might be." Researchers did give the skull's owner a new name, Homo erectus ergaster georgicus, in a nod to the skull as an early but novel form of Homo erectus found in Georgia. The site of the discovery—thought to have been close to an important water source—also contained rudimentary stone tools hinting at early butchery techniques and the bones of large, sabre-toothed cats. Were ancient human migrations two-way streets? RE: "It could be something new and I don't understand why they are reluctant to think it might be." Understand this: Mutation-initiated natural selection cannot explain the adaptive evolution of any species. That biological fact was reported in "An experimental test on the probability of extinction of new genetic variants." Mutation-initiated natural selection was Haldane's idea in the late 1920's, and many people just accepted his idea as if it were factually based. We now know that adaptive evolution is nutrient-dependent and pheromone-controlled in species from microbes to man. There is no reason to think that different lineages — such as Homo habilis and Homo rudolfensis—were anything other than conspecifics of the species Homo erectus who developed different nutrient-dependent phenotypes, which were selected in the context of pheromone-controlled reproduction. Thoughts of mutation-driven evolution are not new. Evidence of cause and effect is; think about the evidence! With our sun Sol, showing it true colors with delayed magnetic reversals revealing strong cosmic rays from the equator changing the shape of-- and the duration of Earth within it-- the heliosheath , we begin to see what drives what we call evolution. IF my theory about 'sun flakes' --magnetic field fragments from the sun's reversal--is correct, then these 'flakes' impact areas of the surface of the Earth, land and sea alike, imbuing the impacted area with reversed magnetism and energy. I propose the impacted areas are large, the impact very energetic, and the results extremely long lasting, perhaps 1,000s of years. The result is condensed matter, the tightening of the molecular level of matter. Mitochrondria does not leak, free radicals are dealt with, and a more effectively adapted specimen is created. This is not a violation of the Second Law. Unfortunately, as our past shows, this effect wears off eventually leaving a 'myth' of long life and extreme intelligence. In spite of two findings from Einstein and Planck, one to show the equation between atoms and energy and the other to discover the constant between waves' frequencies and energy, traditional science has never closed the circle. Still today, the transformation from waves to atoms is not recognized by this antiquated science. The origin of the Universe is revealed even by the spark appearing from the friction of two cutting blades while they are being sharpened. Try to videotape the spark appearing from those two blades, then watch again the same film while is being rewound and in slow motion. You will see the light from the spark entering the blades and becoming part of them. In fact, the photons of light are the "building blocks" of the metal blades. This simple example should also be a clear indication to explain how the whole mass had been formed in the Universe. Once they have reached one critical level of energy, lost heat as they travel and having therefore reduced their frequencies, waves collapse, also forming two subatomic particles with opposite charges, as if they were the split ends of one broken hair. Since the Big Bang, waves continue to solidify into hydrogen atoms and transform their energy in different forms of mass. The Human beings, made up of atoms, are the ultimate product of a slow process started by the transformation of waves. Wavevolution shows how the Behavior in waves and atoms is identical and how one same movement in all that exists is comparable to One Universal Law or Single Will that creates the whole Universe. The discovery of the existence of one Single Universal Will that had one beginning about 14 billion years ago and that was not caused by Humankind confirms as a consequence the Will of One Creator.